The Pea Blue is a widespread and common butterfly, occurring whenever its caterpillar host plants, Crotalaria pallida and Crotalaria retusa are grown. The adult butterflies fly rapidly on hot sunny days, often stopping to feed at the yellow flowers of its host plants. The upperside of the males is dull purple-blue with two black tornal spots on the hindwing. The female is brown above with pale shining blue wing bases. The underside is pale buff brown with white streaks, with orange-crowned black tornal spots. There is a filamentous white-tipped tail at vein 2 of the hindwing. 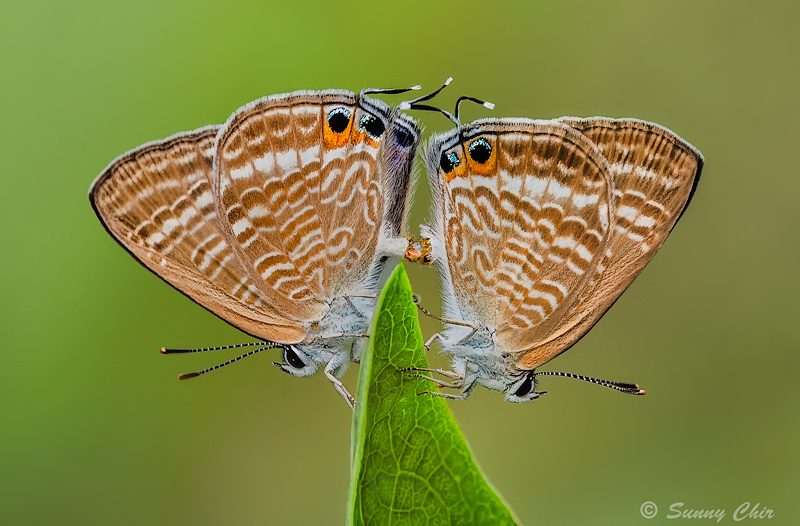 This excellent shot of a pair of mating Pea Blues was shot last weekend by ButterflyCircle member Sunny Chir. The pleasing composition with a creamy smooth background with pastel shades allow a viewer to focus on the mating butterflies perched on a green leaf tip. 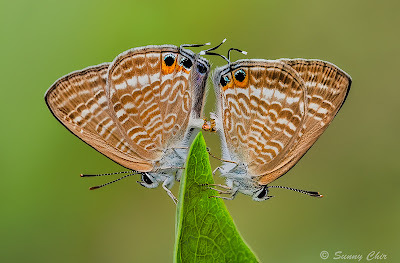 A small aperture ensures a good depth-of-field to render both butterflies in sharp focus.